The Story of Rama books (Parts I-II) together relate in 16 episodes, the story of the Ramayna. Part I introduces: the standard method of transliteration; the gerund (‘having done something’); and the declension of the Sanskrit word for ‘that’ in all three genders. Part II covers an introduction to the imperative mood; other important noun and pronoun declensions; ‘having done something' used with prefixes; the past passive participle; the conjugation of the middle voice and the verb ‘to be’ in present, future and past tenses; and the completion of the standard method of transliteration. 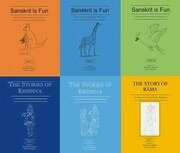 This book seeks to teach Sanskrit with reference to the age-old stories of Krishna and Rama.